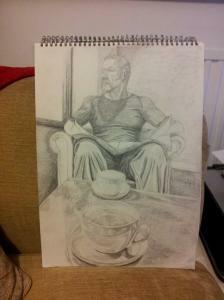 This is sketch I'm working on at the moment you can see the images in my sketch gallery, they are works in progress. It's Christmas holidays at the moment so in between putting decorating up and wrapping presents, I'm having to make a little time to sit and sketch and hopefully improve on my eye for drawing. I'm writing this Blog as a diary of my sketches and their progress from start to finish. I trained in Art an Design and Fine Art also studying ceramics and metals. I'm not a blogger so this will be a test for me. So I will let my work and my descriptions do the talking. I was born in 1966 in the City of Manchester the United Kingdom. Yes the year we won the World Cup.